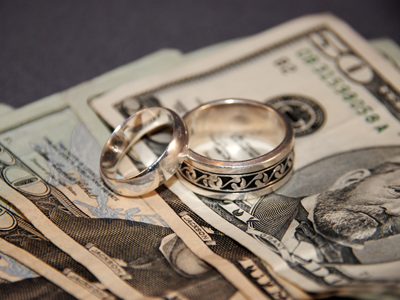 You’re ready to begin a new life together, and in spite of all obstacles you will pledge, “for richer or for poorer.” Your marriage is sure to have many challenges, and mastering money is a big one. Expect a few good money fights. “You bought that! ?” is often the first sign that the dam is breaking and an ensuing torrent is about to flow. Couples that fail to prepare for a shared money maturity will likely experience longer and sharper growing pains. Most people bring emotional baggage from their childhood years that can complicate the matter. I will be presenting a series of exercises that will help you examine your past relationship with money and ensure a bright future together. Begin by separately writing an autobiography that focuses on your relationship to money and the beliefs you have acquired. Each of you has been shaped by experiences with money management. You picked up most of them through implicit observation. If you are like me, you may want to list bullet points, or you may prefer to compose several paragraphs. Some people end up writing a small book! What events have shaped your thinking? My own biography focuses on the formative middle school and high school years when my father was beginning a small business and we as a family were asked to tighten our belts. What fears do you have about money? What voices remain inside your head? For example, “I don’t want to act like my Uncle Bobby who . . .” Some voices will be helpful and others not so much; be sure to name them all. This exercise can be most powerful when shared with other couples, both married and engaged. As you share these stories with each other and ask questions to better understand more deeply, you are developing much needed communication skills about a subject that is both very intimate and traditionally unspoken. For those of you who take the time to write your money autobiography and are willing to share about the experience, please let us know what you gained from the process (there is a place for your comments below). Did you have any revelations? How would you describe the conversation about this topic? Did you learn something about your soon-to-be spouse that you did not know before?